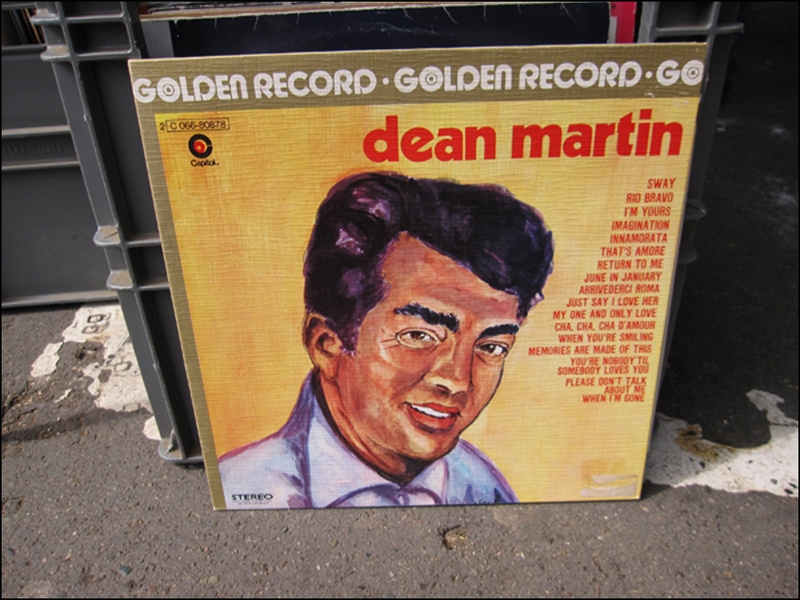 Blame it on the falling autumn leaves, but suddenly I’ve got a hankering for some good old-fashioned, finger-snapping, moody-bluesy time travel at the Porte de Vanves Flea Market. Grab my hand. Here’s one for the ode. Thank the notorious “rag and bone men” (today’s “dumpster divers”) for getting the flea market party started in Paris during the late 19th century. 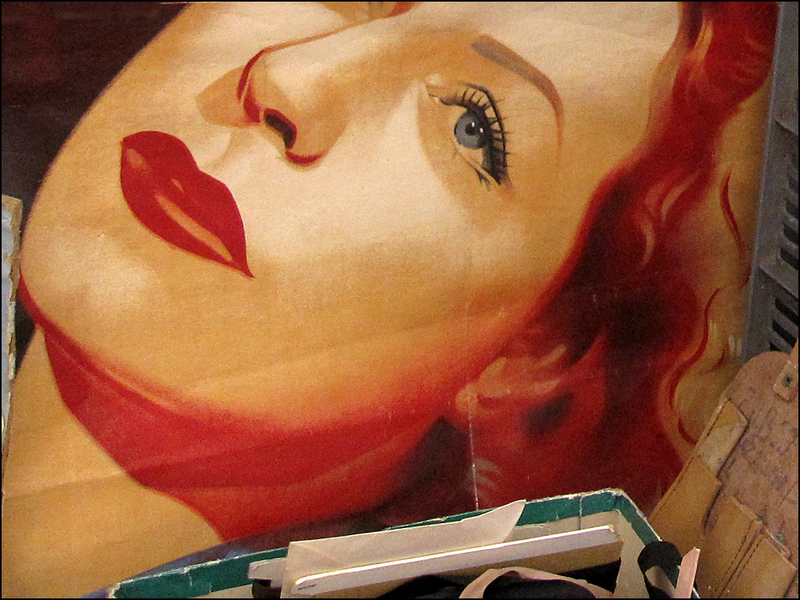 Mon Secret: The one down at Porte de Vanves is where I find most of my retro treasures. Mum is the word. Throughout the market, you’ll find racks, tables, and boxes of vintage clothes, holding court with costume jewelry, bags and belts, hats, sunglasses and shoes. 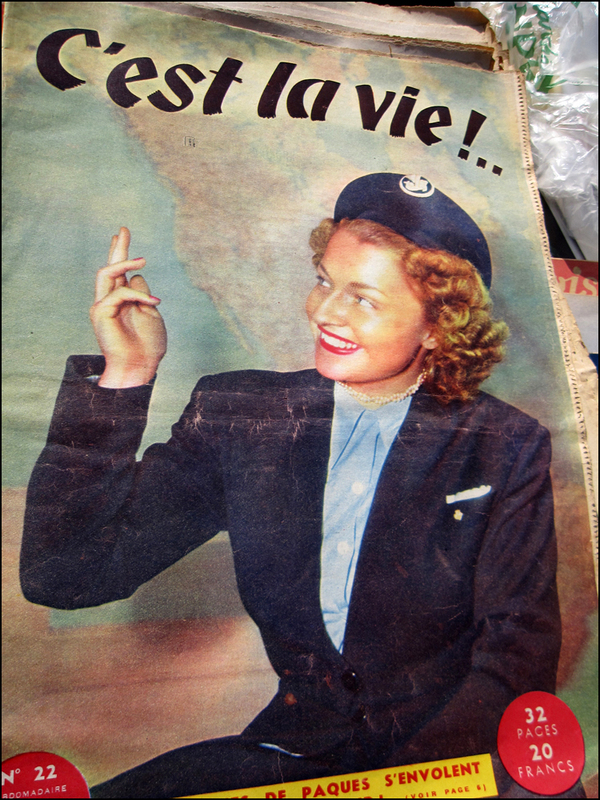 Collect old copies of fashion rags like Marie France and Elle? They’ve got you covered. Also, be prepared to be bug-eyed by the market’s cool mix of absinthe spoons, glazed wine pitchers, and tastevins (nubby-bottomed wine taster’s cups), along with ice buckets, ashtrays, glasses, and bottle openers, all sporting logos of old-school French bar classics like Suze, Ricard, and Picon. And since you can still buy these Cylindrical Dandies at supermarkets like Monoprix, you can dial back the clock with all the senses, not just your sense of style. À votre santé! Now, let’s dust off my Flea Market Tip Sheet. Market Warriors, unite. We’re off to the Puces! As the flea market opens at 7 a.m., and the dealers start packing up to leave around noon, get your beauty rest, but plan to arrive early. Save time by trapping your breakfast at Le Fournil de Vanves Patisserie, located next to the “Porte de Vanves” Métro exit. I recommend giving their flaky, heart-shaped palmiers a shot! Organize a small “till” the night before. I usually carry €50 in coins and small bills. If you forget, don’t fret. There’s an ATM near the “Boulevard Brune” exit from the Porte de Vanves Métro. Tip: In France, most ATM machine “keys” do not include letters, just numbers. So what to do if you’ve memorized your password as “Hero” and not as “4376”? Get thee quickly to a payphone booth. Here the keys include both numbers and letters. Voilà, Super Man! This tip saves the day every time. And speaking of numbers, if you plan to shop for clothing or shoes, get to know your European size numbers. There are no cha-cha-changing rooms at this open-air affair! Pack a survival kit: water bottle, chocolate (for energy), moleskin, Métro tickets, and maps with flea markets and brocantes circled, and coins for WCs. Also bring a sturdy bag, because dealers tend to give out flimsy plastic sacs. Most grocery store chains sell bold and beautiful fiber-cloth bags for less than a euro. It’s great to have a “quest” in mind, since visualization will help narrow your hunt while increasing your chances of finding the object of your desire. Also, mind the gaps. What’s missing from your closet? A vintage belted trench coat in black or khaki? A stiff striped shirt? Glossy ballet slippers? All three are timeless French classics, and souvenir-worthy. Don’t buy the first treasure you see, since you may spot a similar, less expensive item later on. And don’t dawdle—the market stretches for about eight or ten blocks along Avenue Marc Sangnier and around the corner on Avenue Georges Lafenestre. When you get to the snack wagon on the corner you’re halfway. You can always go back and snag something if it’s still calling your name on the way back. These are usually marked with hand-written signs like, “TOUT À €5 CETTE TABLE.” (Anything on the table for five euros). You’ll find them scattered throughout the flea market. After shopping, grab a café at the nearby bar “Grill 14” and admire your newly-acquired purchases. Always one to boast, I recently scored yet another pair of Salvatore Ferragamo pumps. 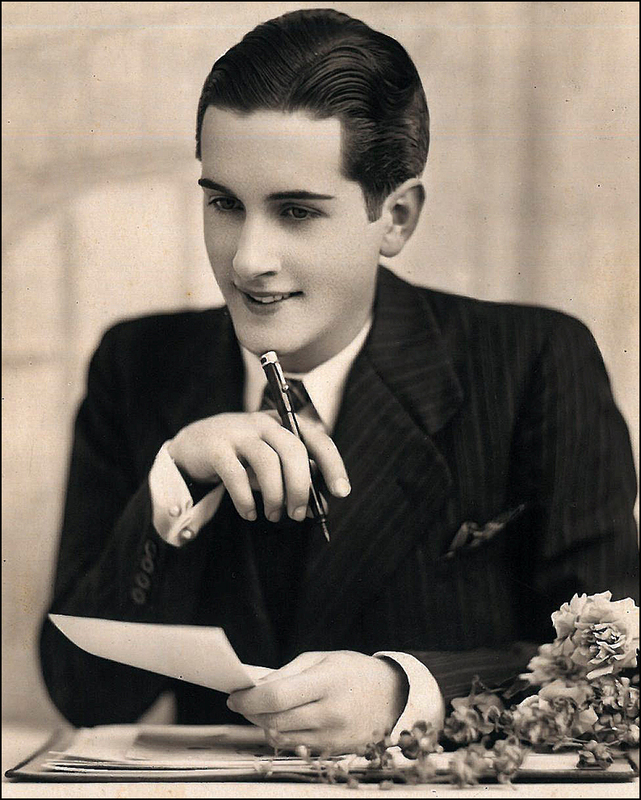 Back in the day, he created wonders for Mary Pickford and Marilyn Monroe. His shoes usually retail for big bucks, but on this sunny day, the dealer let me sashay away with them for just €20. Talk about a Hollywood ending! If your morning at Porte de Vanves only whets your appetite, then hop on the “95” bus and ride it clear across Paris to the Porte de Clignancourt flea market, which stays open till 7 p.m.
For the mere price of a metro ticket, you’ll be able to kick back and catch your breath while the panorama of Paris rolls by en route to the next market. The 45 minute ride will give you time to rest your feet. Plus, it’s one of the most scenic bus routes in the city, so don’t pack your camera away. Clipping from designer Elsa Schiaparelli, “Buy only the best or the cheapest!” Happy Hunting! I love flea markets and your posts! Ah, thank you!! Do you have a favorite flea market in the world? T.
Merci! Did you make it to Porte de Vanves during your recent Paris jaunt? Were any treasures scored? T.
I vant to go mit you NOW!! I so love the Paris Flea Markets! As I have told you before …………I especially love any old clothing that I can model and run about the crowd creating some extravagant persona………..oh what fun! I love you. I love your spirit. I love this story!! I bet the dealers also adored you. What fun!! One day we will have to shop ’til we drop. T.
I never grow tired of this blog / you posts! Have a great day! Great day to you! Thanks for such swell words. I feel the same way about your work. I love to see your name pop up in my inbox. Enjoy the weekend! T.
Yes, I love flea markets! I haven’t found a favourite one yet, but I’m going to be in one called Suitcase Rummage in Melbourne in December. You are allowed to take three suitcases and have vintage or handmade goods in them to sell or swap. I can’t wait!! Sounds lovely, especially the lunch time! I love thrift shopping and bargains. Merci. I also love thrift shops, consignment boutiques and vintage clothing shops! I dig them all. I am hooked. This is how I spend most weekends. Do you have a favorite thrift haunt or shop? T.
Great fun. Thank you for sharing your latest adventure with us. I love all your posts! Thanks, Karen! Are you a flea market shopper?! T.
Karen, I’m with you. I’m a huge fan of the yard sale. So you also rescue furniture? That’s very cool! Have you taken photographs? Have you featured a shot in a post? I’d love to see one of your works. T.
One man’s trash is another man’s treasure! I love strolling through flea markets – the last marathon one I went to was St. Ouen in Paris (I believe it’s the largest). I agree! St-Ouen is also pretty darn great. It’s the perfect place to window-shop and people-watch. Do you have a favorite dealer or stall? I’m a big fan of the “cartes postale ancienne” shop at Caveyron Devey, located at stall number 7 and 8 in the Passage Lecuyer (off Rue Jules Vallès). Here is where I buy most of my postcards. I’ve spent entire afternoons here, pawing through the boxes. The shop is very organized. And the cards are affordable! T.
I haven’t been there in a long time, but enjoyed the people watching and listening to all the price wheeling and dealing. All the stalls are so varied and interesting. Thank you for recalling me this particular place! Paris magique! Thank you, Roberto! Porte de Vanves is one of my favorite places in the world. I’m with you. It’s a magical place. Paris is a magical place! Enjoy the weekend! T.
Your images are definitely ‘the next-best thing to being there’! A wonderful tour of Porte de Vanves…you’re so lucky to be able to present places like this, letting the world know so much more of “Gay Paree”! Thank you! It’s a fun place to photograph, especially early in the morning with the smell of coffee and cake in the air. There’s also a little live music by the snack stand. It’s a festive place! Does Chicago have a big outdoor (or indoor) flea market? B. Not that I’ve found yet…sounds more like a thing apopos to the ‘burbs, which I no longer get to (except for Evanston, which is less than a mile away!). Lily, I always, always enjoy shopping with you! 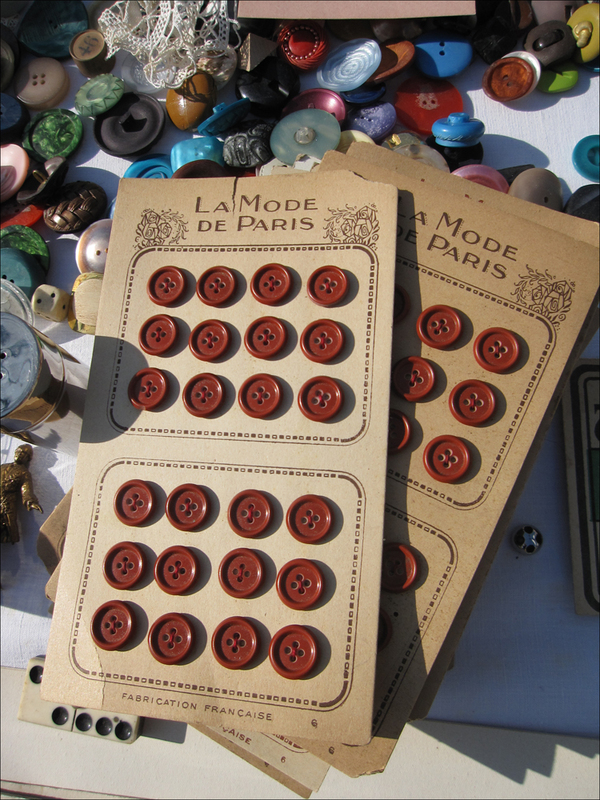 I ended up buying the buttons, of course. They were on the “one euro” table, along with a few records. Perfect muses for writing! T.
I love it. Can’t wait to go the next time I’m in Paris. YES. Add both Porte de Vanves and St-Ouen Fleas to your list. You won’t be sorry! T.
Thanks, Richard! Do you have a favorite Flea in the world? The Fleas are prime portrait-taking grounds, I do believe. T.
My favourite was one in Germany, but I can’t remember whereabouts – somewhere near Hannover – I was taken there by a friend, who loved it, and it was, of course, brimming with treasures. Ooooh. Fun. Richard, if you happen to think of the name of it, let me know. I’m filling a notebook with drool-worthy flea markets. Enjoy the weekend! T.
Oh to be back at the Paris marche aux puces! 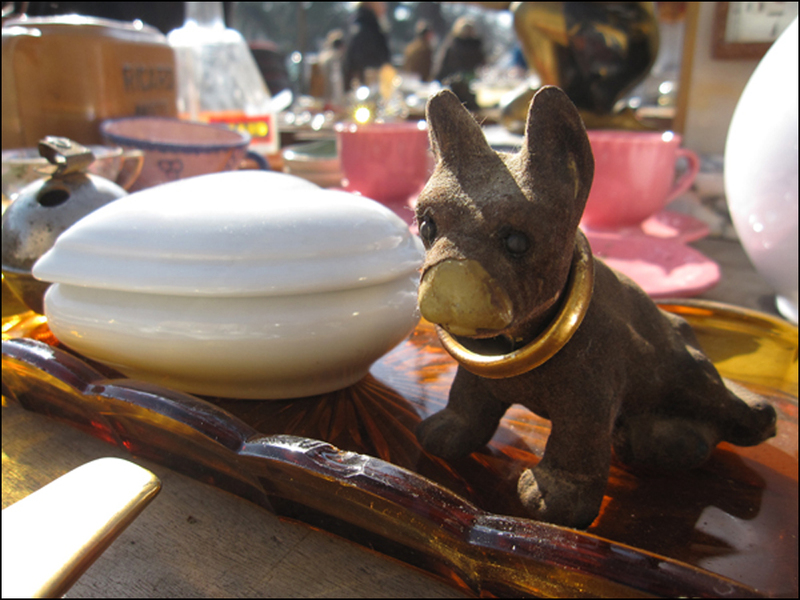 Do you have a favorite brocante or market in Paris?! T.
Dear Mari, I agree! Clignancourt is a superior Flea. I loved, loved your story about the WWII bracelet. I got a little weepy. What a treasure. What a souvenir. By the way, I’m looking forward to reading your “Parisian by Heart.” The cover is beautiful! Bravo. (I have a hand-painted powder puff compact that celebrates the liberation of Paris by the Allied forces. A collection heart stopper, it’s one of my favorites.) Also, thanks for the postcard link! Yes. YES. I know this place! I’ve spent entire afternoons here. The shop is so organized. Especially on chilly autumn days, I love sitting at the picnic table, flipping through the cards. They’re affordable, to boot. Oui. I’m a loyal and repeat customer! T.
Dear Theodora~ I’m so glad you enjoyed the postcards link, my husband kicks himself on a regular basis that he did not buy more postcards there. And I have this fantasy of going back to the place where the store owner gave me the bracelet and give him my book with my husband’s photo of the bracelet on the cover and the story of his gift to me inside. 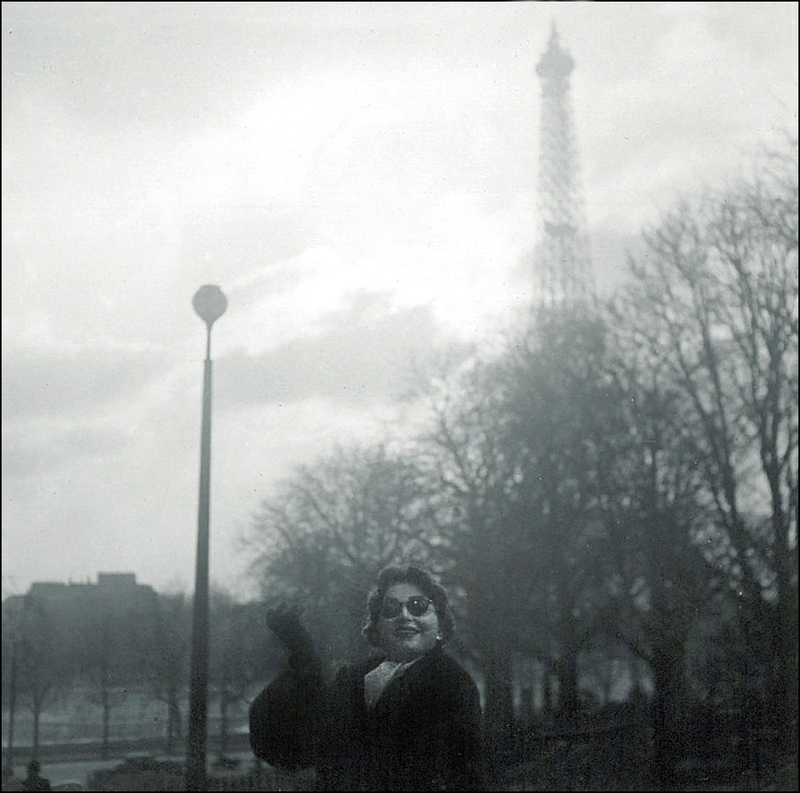 You mentioned that you were looking forward to reading “Parisian by Heart”; do you have a copy? I ask because, if you’d like, I’d be happy to sign one for you and mail it to you, no charge. You can contact me at marimann@cox.net. Also I’d like to say how much I enjoy seeing you on Pinterest! I live vicariously through your pics. What a great way to spend a day, just picking through stuff and treasures. Great photos, I love it when you drop in to my inbox. Thanks for your swell words!! I agree with you. Treasure hunting is the perfect way to spend the day, rain or shine. I am hooked. T.
Great photos Theadora – again! Do have a favourite place for seeking good quality fifties-style garments? Is it this one peut-etre? Merci. Thank you!! I’d start off at the Porte de Vanves Flea, and then head for Abbesses and the Marais. Both historic ‘hoods have deep pockets of vintage clothing. Plus, the shops are open on Sundays. What type of garments are you looking for? Are you looking for bargains or high ticket garb? I’ll create a mini-list for you! T.
Thanks T, I am probably more of a bargain hunter, I love pretty waisted dresses with those lovely full skirts’.Real fifties style. Merci. Very different from my post on flea markets, where I ended up with nothing! I think I can shop here for hours! Say, your recent Baroda Flea Market post was amazing. So interesting. From top to bottom, the photographs were beautiful. I couldn’t stop studying the series! T.
See the difference between the two cultures! I hope that you do come to India at some point to see it! It’s on my travel wish list!! T.
Wow, I am opening google maps to mark it on the map! Thanks for posting! Merci, Isabella! Keep on painting!! T.
Your blog is a treasure to behold in itself. Thanks for the finds! Ah, Anita, thank YOU! Blushing, here. T.
I had a fabulous time touring the flea market with you. Things fit, I found all kinds of treasures, I enjoyed eating and shopping and all that jazz —- and now my feet don’t even hurt! It’s noble of you to do all the hard stuff and share the enjoyment with us vicarious folk! WOW! Looks like a blast! Can’t wait for the day we will get to vintage pick in Paris! Merci beau coup! MERCI. Shopping at the fleas is always a blast. Even during the chilly winter months. Hot chocolate is also available for sale. Thank goodness. Add the Paris Fleas to your list! T.
I agree! It’s always fun to people-watch at the Paris fleas. And YES, throughout the late morning and afternoon hours, the dealers stop and eat their lunches. I love watching them share their meats, cheeses, and wine. Gorgeous! T.
i love your mannequin shots! very artistic.. Thank you! Mannequins are fun and easy, breezy to shoot because they don’t move or blink. Plus, they’re so darn photogenic! The mannequin in the top shot recently experienced a spill and a damaged nose. Poor gal. She is still a looker, I think! T.
Be still my heart. Shopping the Flea Markets of Paris. What a glorious adventure. And I have all the scoop from the adorable Theadora. Oh to be in Paris bargain hunting. I was feeling more than a little blue as I headed into our tiny village to fill my shopping bag with chicken and chocolate and I really nice bottle of pouilly fuisse. With Theadora on my mind (and in my heart) I popped into our little Thrift Shop hopeful I would find a treasure. In a tangle of shoes I spotted not one – but three pairs of Ferragammo’s. IN MY SIZE.! I wore Ferragammo’s back in the days when I was running the front in our little Bistro. Perfect for long nights on my feet. I still have those shoes and now I just added to my collection. The killer – $3.00 each. Navy blue, black satin, black patent shoes. I shall be generous and share. My sister will receive the navy blue. Theadora was my lucky charm today. Goodness. Gracious, Virginia. Three pairs of Salvatore Ferragamo shoes in your size? This is epic-weepie, Cendrillon-worthy story. Interesting company! For the deep love of shoe history, perhaps I’ll create a post. Catherine Deneuve was a fan. Back in the day, she fancied their signature “Pilgrim” style. I think she wore them in “Belle de Jour” flick. Do you have a favorite style? I’m with Catherine. I dig the “Pilgrims.” They’re comfortable and flattering, to boot. So you still have your bistro treasures? I love this detail! T. (Enjoy the weekend!! They are all “pilgrim style” except the navy leather pair I gave to my sister. They had a lady-like heel and a smart little belt-like trim. When I spotted the first pair – the shiny black patent shoes – my heart skipped a beat. Then I discovered the other two pair. Some discerning gal was cleaning out her shoe closet – too my great advantage. (This has never happened to me before). 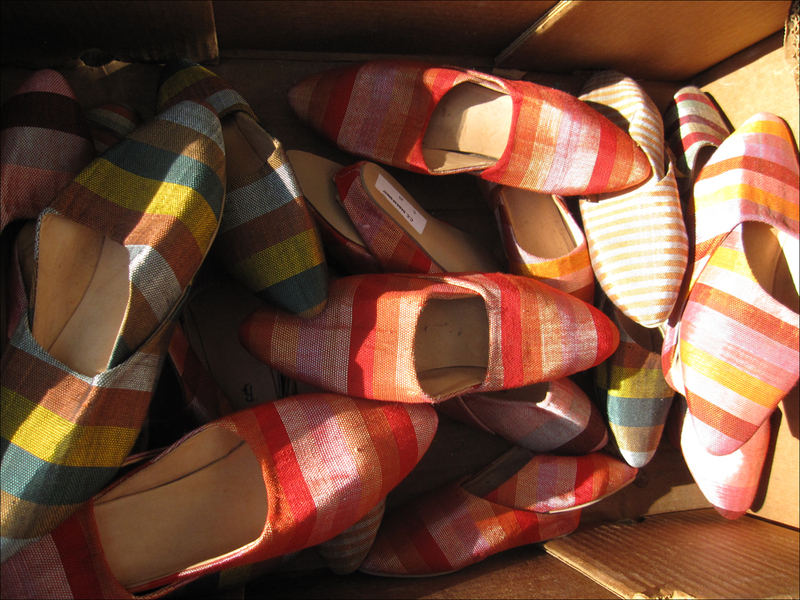 I now have 82 pairs of shoes in my shoe closet – with the Ferragammo’s probably the least expensive. I am obsessed with beautiful shoes and boots. Now if I could just find the perfect ruby slippers. V.
Wow. I’m AM impressed. What luck. I’m also hooked on shoes. Have you seen the “God Save My Shoes” film (2011)? I think I’ve asked you this before. The trailer is fun and fabulous. Heroes Pierre Hardy and Christian Louboutin are featured in it. Also, there are great shoe shots in the “Bill Cunningham New York” doc (2010). Another beautiful film! T.
I haven’t been able to locate God Save My Shoes , but my clever son said he can find it for me. Now I will ask him to sleuth out Bill Cunningham New York. V.
MERCI. Thank you for your thoughtful holiday shout-out. I appreciate it. Sending festive and cozy vibes to your campsite. Enjoy the weekend!! T.
Theodora, your posts are always so well researched and written! They are a pleasure to read and I can’t wait to actually visit these places when I go to Paris! I was thinking about you the other day – do you remember the man with the red glasses and goldfish earrings? I bumped into him again! It seems he has changed the glasses up with pink frames but the goldfish accessories are still going strong! 🙂 Hope that you are having a great start to the week! J. 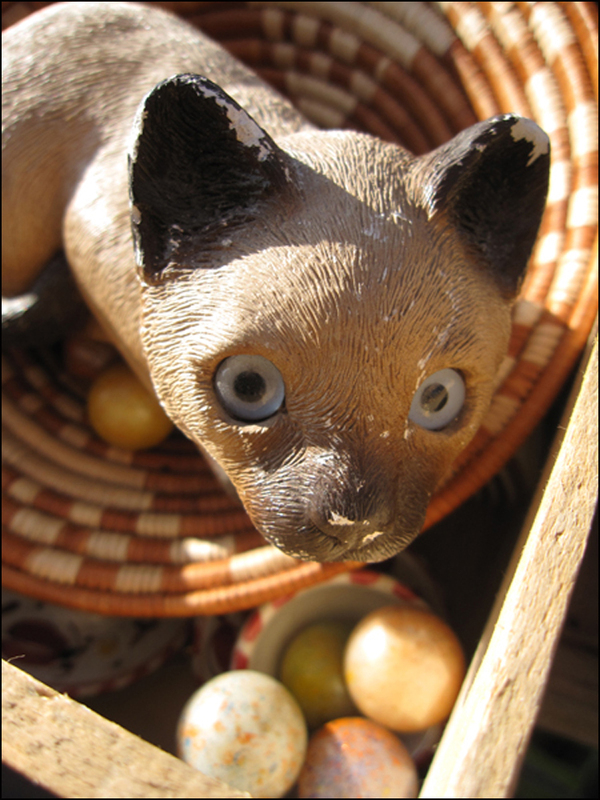 Have you ever checked out the flea markets in Provence? Ile-sur-la-Sorgue has the largest outside of Paris. It is, in fact, the entire town. And on weekends when the regular market comes in, it’s astounding. We take people sometimes to do this. (Of course, I do go on my “days off” as well :)). You might like it. Maybe we’ll have the chance to include you next time we do a day trip to ile-sur-la-sorgue. It’s a long day if you must return to Paris, but not too bad if you are willing to spend one night in Provence! I’ll keep in touch!! 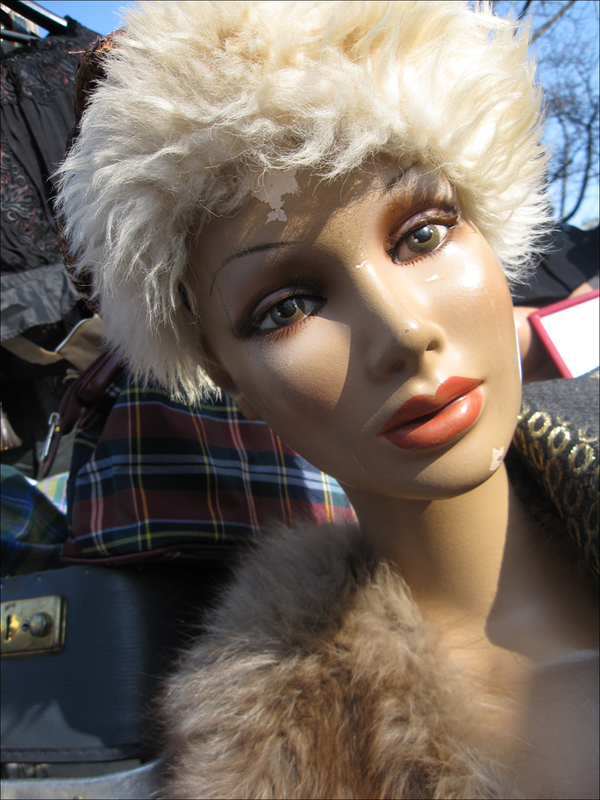 T.
I love how your photos showcase the wares at this particular flea market all on their own. I didn’t expect to be surprised by the tips but I was! Paying for the WC and the market closing as early as noon is completely unheard of at the Rastro in Madrid. I am constantly surprised at the vintage shoes you are able to score. You’re one of those people turns shopping into the thrill of the hunt, aren’t you? Wondering, can a girl pick up a tiara there? YES. It’s all about the hunt!! Tiaras. Sadly, I haven’t seen many tiaras or big powdered wigs. I have spotted Champagne glasses and royal historical side plates. Like baseball cards, I collect them like there’s no tomorrow. They’re great conversational starters at dinner party shindigs. You’d love them! T.
marie antoinette, historical kick-knacks, dinner parties and now baseball cards? Is it something in the Tri-State water? I KNOW. By the way, I also spy Marie Antoinette dolls from all decades. Some are quite funny looking! T.
snap a pic or two for me if your camera and aforementioned m@ dollies are ever in the same place, pretty please! MERCI. The feeling is mutual! T.
Gosh, thanks the big grin!! T.
Ug! 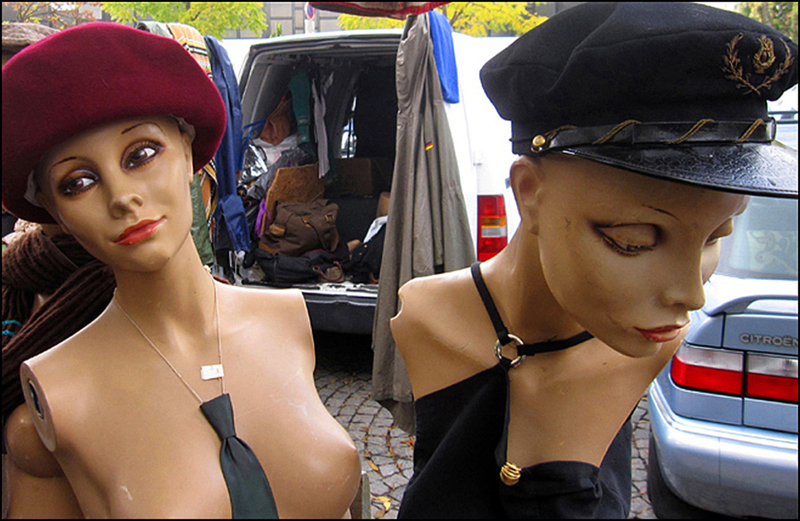 I miss Paris so…thanks for taking us to the flea market! Thanks, Elizabeth! It was great fun shopping with a fellow Flea Market fanatic. Did you find any treasures?! T.